The fact that the presence of a complete right bundle branch block (RBBB) increases the risk of bradycardia, high-grade atrioventricular block, and need for a permanent pacemaker (PPM) after TAVR is well-known. The impact of pre-existing complete right bundle branch block has not been well-studied. This article analyses 749 patients enrolled in the OCEAN TAVI study, 102 (13.6%) of which presented pre-existing complete right bundle branch block. All patients received an Edwards SAPIENS XT valve. No differences were observed among groups, except for a higher prevalence of cerebrovascular disease in patients in the pre-existing complete right bundle branch block group (21.6% vs. 13%; p = 0.02), who also presented a higher annular area. After implantation, this group presented higher life-threatening bleeding (11.8 vs. 6%; p = 0.03) and a higher need for a pacemaker (17.6% vs. 2.9%). Patients in the complete right bundle branch block group showed a trend toward lower survival rates at 30 days (96% vs. 98.6%; p = 0.09). At the 492-day follow-up (325-660), the incidence of aortic regurgitation and ventricular function was similar among groups. The rates of all-cause death, cardiac death, and death from heart failure was higher for patients with complete right bundle branch block. In the Kaplan-Meier analysis, the presence of complete right bundle branch block without pacemaker was associated with a higher rate of early cardiac death, and follow-up revealed higher mortality rates in patients with complete right bundle branch block and pacemaker. In a multivariate analysis, pre-existing complete right bundle branch block was an independent predictor of mortality. 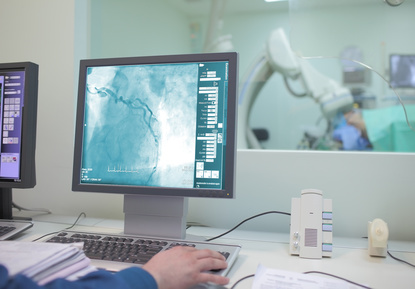 Patients with complete right bundle branch block showed an increase in the risk of cardiovascular mortality after TAVR, and patients with complete right bundle branch block without pacemaker presented a higher risk of early cardiac death. Patients with prior complete right bundle branch block should be carefully monitored after TAVR. The presence of complete right bundle branch block surely reflects high-risk conditions that have not been well studied yet. We should carry out a thorough monitoring of this high-risk patient group and anticipate both the need for a pacemaker after discharge and the presence of heart failure. That way, we may be able to lower mortality rates. Courtesy of Dr. Carlos Fava. Buenos Aires Favaloro Foundation, Argentina. Original title: Pre-Existing Right Bundle Branch Block Increases Risk for Death After Transcatheter Aortic Valve Replacement with a Balloon-Expandable Valve. Reference: Yusuke Watanabe et al, J Am Coll Cardiol Intv 2016;9:2210-6.